I am thrilled to be again serve as an ambassador for the ZOOMA Great Lakes Half Marathon this year! This was such a fun race last year. It should be even better this year! Next price increase is April 2. **Code is good for any ZOOMA race or challenge in 2019. The Milwaukee Lakefront Marathon was another for the books. Three years ago, this race was — what felt like then — the race of a lifetime. This year, this race was better, if only because it brought me a new personal record. I again went into this race relaxed. I had a good shot at beating my time from three years ago. I had trained hard, putting in the hill training and speed work over the previous four months. I had endured some brutally hot, humid weather. I had stayed, for the first time in a few years, illness- and injury-free. I was excited to see Christopher and the girls, my mom and my dad along the course. 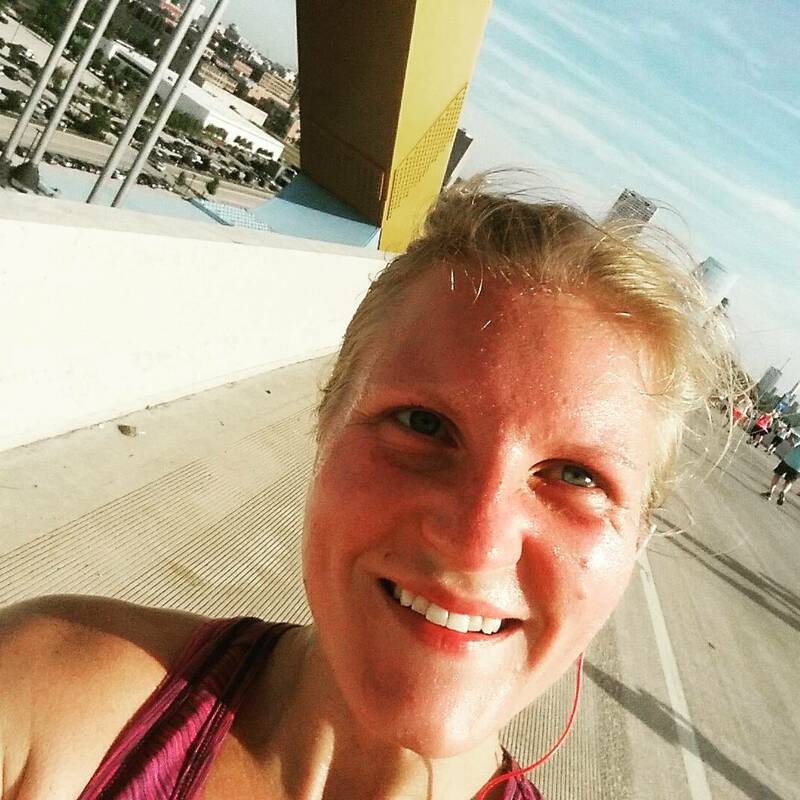 I was excited to run through familiar neighborhoods and along the iconic lakefront. My mom drove me to Grafton High School, and we scurried inside to stay warm until it was time to head toward the starting line. We finally headed outside with about 15 minutes until race start. I lined up behind the 4:20 pace group, but ahead of the 4:30 pace group with intentions of staying comfortably between them. The race director counted down and blew the horn, and we set out for our 26.2-mile journey. Just like three years ago, somewhere between Mile 1 and 2, as the course ventured into its only truly “rural” setting, the breeze blew in the unmistakable smells of a dairy farm. I laughed as everyone around me grimaced. I took that moment of deja vu as a good omen for the race. At about Mile 5, I saw my mom. I did not expect to see her out on the course, so I was pleasantly surprised. She was so excited and cheered so loudly and proudly. I felt some aches and pains around this point of the race, but I shook them off. I had too far to go to get into my own head about those tings and twinges. I told myself to push forward, nice and easy. Between miles 8 and 15, the course heads south through Mequon and Bayside, fairly close to the lake, where the houses are beautiful and large, but the roads are pretty quiet. There were plenty of spectators, many who used our first names, which were printed on our bibs. Around Mile 15, and again after Mile 20, I saw Christopher and the girls and my dad again. At that point, my low back was really sore. I tried to focus on remaining upright and pulling in my core to support my spine and tailbone. I reminded myself there was just over 6 miles left of the race and, with a steady 10-ish-minute mile, a personal best at the finish. After Mile 20, the course gets into familiar territory–the UW-Milwaukee campus, Lake Park, and Lincoln Memorial Drive. It’s always such an incredible sight to head toward downtown. There are three aid stations between miles 21 and 25; I had not truly walked through any of the aid stations until those last three, forcing myself to relax my stride. I probably lost the most time in those three stops, but I needed those mental breaks. In the last two miles, I pushed it as much as possible. Whereas Mile 23 was my slowest mile of the race at 11:22, Mile 26 was my second-fastest of the second half at 10:01 (Mile 13 also was a 10:01, while Mile 15 was a 9:58). The last quarter-mile of the race is unlike the last stretch of any other marathon: The crowd is thick on either side of a fairly narrow path. Spectators fill bleachers 10 feet into the air on either side of the chute. It is loud, as people are cheering, clanging cowbells, and clapping, and the race director is calling out the names of runners as they cross the finish line. It was close. But I didn’t care. I wanted nothing more than to stop running; my stomach was uneasy, my legs were shredded. I had given it everything. After I had my medal around my neck, I trudged through the muddy finish area to claim my gear bag and my snack bag. In the runner-spectator meeting area, I finally found Christopher and the girls and my dad. At that moment, I found out my time was about 4:29 — a PR by 10 to 20 seconds. I couldn’t believe it. I squeaked it out. I truly had left everything out on the course. The Milwaukee Lakefront Marathon was, once again, such an incredible race. Sometimes, I have to pinch myself to make sure I’m really doing this running thing and not just dreaming it. I can’t believe my body, my mind, and my heart allow me to dream so big and accomplish so much. I am blessed to have a husband who, year in and year out, supports me through weekend-morning long runs and busy race days. I have daughters who fuel my fire and are my motivation to do hard things. I have an incredible family and amazing friends who believe in me, support me, and put up with all of my crazy running adventures.